Flowers are great to look at, and can add a great deal of color and décor to your home, inside and out. Flowers are used and offered as gifts for a variety of events like valentine’s day, mother’s day, funerals, birthdays, anniversaries, get well, new baby or just to tell someone you love them. In a classic case of “Don’t judge a book by its cover,” some flowers have much deeper stories behind them. Not many people may know the mythology behind some of their favorite flowers, but the stories can be just as interesting as the flowers themselves. 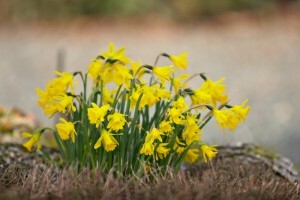 The narcissus flower is a popular one around the world. The genus contains such popular flowers as Jonquils, and Daffodils. There is some debate about where the name comes from, with some claiming that it derives from the Greek word meaning stupor (narke), and others claiming the name comes from the “narcotic” fragrance. Mythology can also be linked to the flower through the character Narcissus. This Greek figure was one of the most beautiful people anyone had ever seen. The nymph, Echo, fell in love with him, but was under a spell cast by Hera and could only ever repeat what someone said and never speak first. While Narcissus is such a beautiful person, he never returns the love of others. Because of this, a disappointed nymph prays to Nemesis, and asks Narcissus to be cursed to love only himself. When Narcissus sees his image in a pool of water, he falls in love with the image and keeps leans further over the pool until he falls in and drowns. The last words Narcissus utters is, “Farewell.” He says this to his own image, but Echo, who is still in love with him, repeats the word as a sad goodbye. In the place where Narcissus died, a beautiful flower grew up, which the Nymphs named Narcissus. Hellebore has both a good and bad reputation, depending on the stories you hear. The flower blooms in late winter, often pushing itself through a layer of snow to give color to the late winter, and giving hope to people that spring is on its way. The plant is actually very toxic, but has been used in traditional medicine as a cure for ailments such as gout, paralysis and even insanity. During a siege at the city of Kirrah, the Greek army used hellebore to poison the water supply of the city. Unknown to the city’s population, the water they were drinking had been laced with the toxic flower and the people became ill. Unable to defend their city any longer, Greek forces attacked and took the city. Alexander the Great was also victim to this particular flower. In Babylon, Alexander was receiving medication from his cup bearer, whose name was Iollas. Greek politicians arranged for hellebore to be smuggled into Babylon hidden in a mule’s hooves. Alexander’s cup was then laced with the toxic flower, and given to Alexander by Iollas. 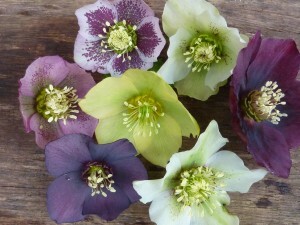 After twelve days, Alexander was found dead from hellebore poisoning. Putting a positive spin on this plant is the story of King Midas’ daughters. Both girls had gone mad (allegedly because of the god Dionysus) and had been seen running through the streets, naked and screaming. Thanks to the healer Melampus of Pylos, who created a hellebore potion and administered it to the girls, they were cured. Hellebore is also known as the Christmas Rose, and there is a Christian legend that goes along with this particular flower. A young Jewish girl witnessed the angels rejoicing over the birth of Jesus. After following shepherds to Bethlehem, she realizes that she has no gift to offer the Son of God. She fell to the ground and began to cry. As her tears wetted the ground, flowers began to bloom, which she collected and offered as a gift to Jesus. As you decorate the halls with boughs of this plant, you can get excited about the holiday of… Saturnalia? Holly was used by the ancient Romans as decoration for their homes for the immensely popular Saturnalia festivities. The celebrations were held beginning on December 17 and included public banquets, gift giving, partying and an overall festive atmosphere. Saturnalia also featured candles signifying a search for knowledge and the coming New Year. It’s easy to see how Saturnalia influenced the emerging Christian religion, and the Christmas holidays. Roman Christians, who had previously decorated their homes for Saturnalia, continued to do so for the new holiday of Christmas. 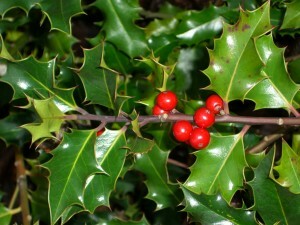 Over time, holly lost its original association, becoming more recognized for its use during Christian festivities. In England, holly was used by girls to reveal their future husbands. During Christmas Eve, New Year’s Eve, Samhain (aka: Halloween) and Beltain (known as Midsummer’s Eve), young girls would pin three leaves on their nightgowns and place three pails of water in their bedrooms. After she was wakened by wails, then later by a horse’s neigh, her future husband would enter her room and rearrange the pails if he was in love with her.